It had been over two years since I received my last fix when I signed up for a shipment a few weeks ago. I stopped receiving them because plain and simple, the items were a little outside my typical price range. However, now that I'm a Mommy, shopping for clothes has become inordinately more difficult than I anticipated. I know it sounds lame, but it's true. I have zero time after work to do any shopping because I have to head straight home to pick up Charlie and then on the weekends there is always the debate: Do I pack the stroller and try to navigate it through the narrow racks of clothing and try to fit it in the dressing room or do I wear my ErgoBaby carrier and put Charlie on the floor while I'm trying things on (Ew!)? 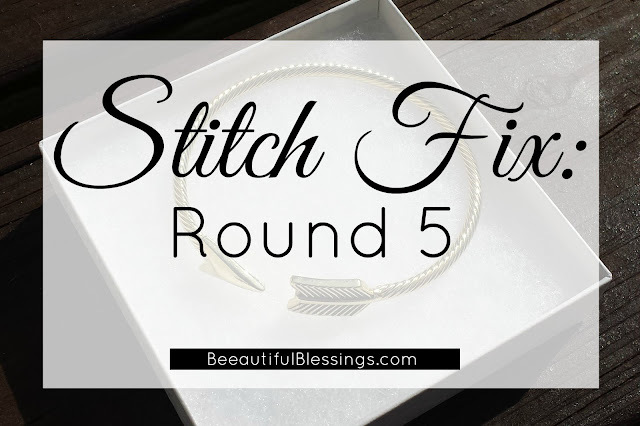 I decided that the option of having cute things mailed to me was worth the heftier price tag and received Stitch Fix: Round 5 last week! 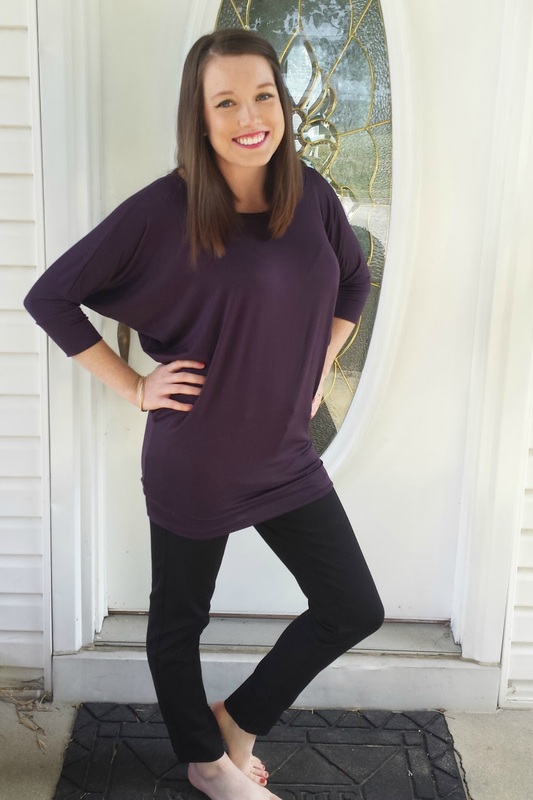 When filling out my style profile, I requested items that I could incorporate into my business casual work wardrobe. I also added the additional note that I was breastfeeding and would appreciate that the items I received were nursing-friendly. My stylist, Kelly, did a great job picking things out for me. My past fixes have been hit or miss, but she nailed it! 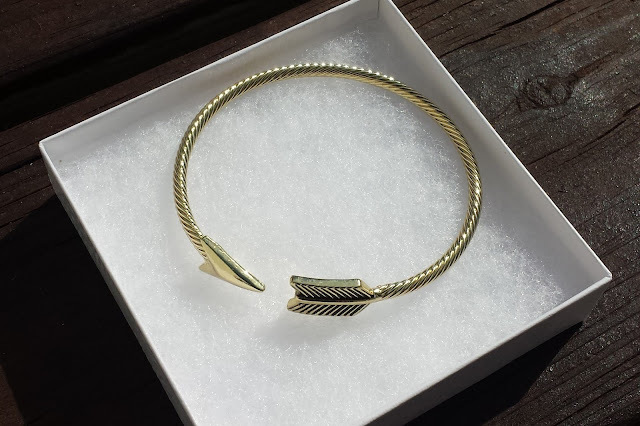 I have pretty skinny wrists as it is, but I feel like this bracelet would be oversized on anyone! I loved the style, but there is no way I would be able to keep this thing from flying off my wrist. 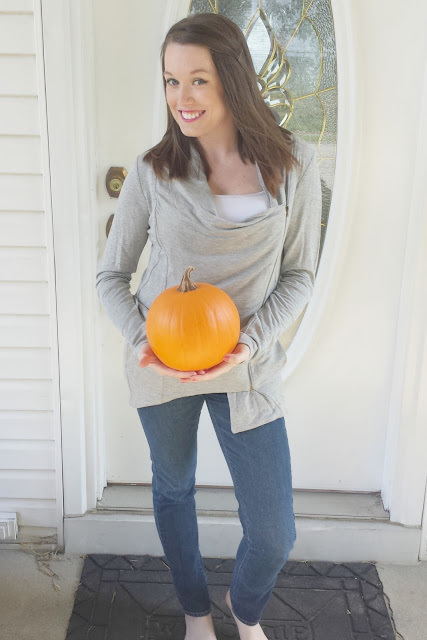 Because obviously I had to pose with a pumpkin! Kelly noticed that I had a nearly identical asymmetrical sweater on my Pinterest board, so she sent this to me. I loved the style, but it was a smidge too big. If I had gotten a size S, it probably would have been much harder to say "no" to, but alas, I wasn't crazy about the price or fit, so I bid it adieu. Oh my goodness, the fit of these pants was divine. Unfortunately, I can barely justify spending $20 on a pair of pants, let alone $78. I did like the style and pattern of the top, but I felt like it made me look wider that I actually am. If it was more of a tunic, I'd be on board. Plus, it obviously wrinkles pretty easily which is problematic for me since I think I've used an iron like three times in my entire life. Ding, ding, ding! We have a winner. This top fit me so well and was suuuuper comfy. Chuck actually pointed out that it would be a perfect top to wear to Thanksgiving, so I could hardly say no. Thanks, fashion forward Hubby! (If you ever saw my husband pick out clothes, you would know how funny this is). So what do you think of my selection? Do you think I made the right choice? To see my prior fixes, go here. If you'd like to try Stitch Fix for yourself, you can use my referral link, here.